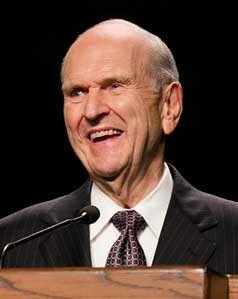 President Russell M. Nelson (b. Sept 9, 1924) was an internationally-renowned heart surgeon when he was called to serve as a member of the Quorum of Twelve Apostles in 1984. He was set apart as president of the Quorum of Twelve on July 15, 2015. "That precious privilege of choice—man's agency—was decreed before the world was created. It is a moral agency. Thus, it was opposed by Satan, but affirmed by the Lord and reaffirmed through prophets in ancient and in modern times. "The proper exercise of moral agency requires faith. Faith in the Lord Jesus Christ is the first principle of the gospel. Because of Him, you have your agency. He must be the very foundation of your faith, and the testing of that faith is a fundamental reason for your freedom to choose. 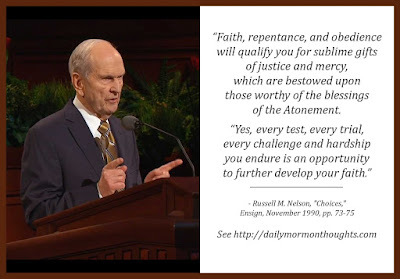 "Faith, repentance, and obedience will qualify you for sublime gifts of justice and mercy, which are bestowed upon those worthy of the blessings of the Atonement. "Yes, every test, every trial, every challenge and hardship you endure is an opportunity to further develop your faith." President Nelson teaches that "moral agency" has existed before this world was created; it was involved in the conflict that arose between Satan and the Lord. The key for our current situation in mortality is that we learn to "exercise" our agency properly by starting with a foundation of faith in Jesus Christ. As we "develop and exercise" that faith in the context of our agency, we experience growth and blessings. It's interesting that President Nelson refers to the "sublime gifts of justice and mercy." We might be more inclined to consider mercy as a divine gift than we do justice; but it's important to note how critical both are for the success of God's eternal plan of happiness. Meanwhile, we should be grateful to recognize that our faith grows and develops as we experience the tests and trials of this life, learning to use our moral agency properly in the process.